Mountain Rescue Airport Transfers offer private transfers from Geneva, Lyon, Grenoble and Chambéry airports to ski resorts in the Tarentaise Valley in the French Alps. Our large fleet of vehicles includes VW Caravelles, seating up to 8, VW Tiguan Allspace seating 3, VW Multivans seating up to 6 and Mercedes V Class minibuses that seat up to 7 passengers. Our ski transfer service covers amazing resorts in France such as Tignes, Val d'Isère, Les Arcs, La Plagne, Méribel, Courchevel, Les Menuires, St Martin de Belleville, Val Thorens and more. Mountain Rescue Airport Transfers is an independent, family run business based in the Alps. Our success is built on outstanding customer service, comfortable new vehicles and conscientious drivers. For Business and First Class transfers to the Alps please contact us directly for a quote. In partnership with the Ski & Snowboard shop Glisshop.co.uk. The Mountain Rescue office team are all about providing a top quality ski transfer service at a competitive price. Our determination to ensure your comfort shines through when the elements are against us! We have over 15 years experience dealing with traffic, flight delays and challenging weather issues. 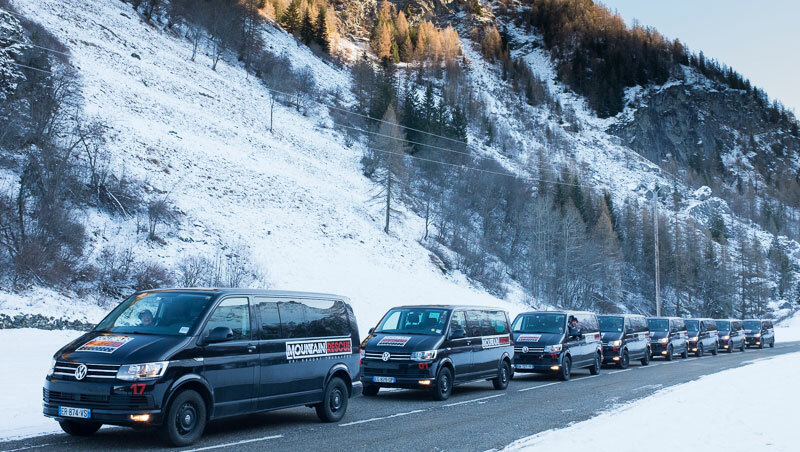 Mountain Rescue combine brand new vehicles, experienced drivers and careful planning by our staff to offer a reliable, professional transfer service in the French Alps. One that we are very proud of. Our large fleet of minibuses (plus our stand by vehicles) gives us flexibility when required. Each vehicle is fitted with privacy glass and multi-zone air conditioning. SARL Mountain Rescue is a French registered transport company. All our drivers are registered in France and Switzerland and are employed under French law. Find out more about our company. Private transfers: Private transfers give you sole occupancy of one (or more) of our comfortable 8 seater Volkswagen Caravelle minibuses. No waiting time at either end of your trip. Business transfers: Provided in Volkswagen Multivans with conference style leather seating for ultimate space and comfort. First class transfers: Go for the VIP treatment with a First Class trip in a top of the range Mercedes V Class minibus. Shared transfers: A priority shared transfer is when two, or more, small groups share the journey to their resorts. A great way to save money on your ski holiday. Summer transfers: We have reduced our prices during the summer so its even more affordable to get from the plane to the mountains when the sun is shining. Excellent transfers to and from Les Arcs. Our flight was delayed on the way out and we kept in touch with our driver, who was waiting for us in arrivals.We had to reschedule our return for a detour on the way home and again, no issue.Would recommend without reservation. Brilliant value, brilliant service, brilliant driver Sophie. Sophie, thanks again from all of the Irish guys with you last week including baby Kiranna for looking after us so well. You are a real credit and asset to your company. You got us up the valley to Champagny in terrible conditions on time and still in good humour. Much appreciated. When we return next year we will be using your company again and asking for you specifically.Simon keep her and keep up the good work. The van we were collected in was brand new, in perfect condition and very comfortable.Thanks again guys. Hope you have a great season. Absolutely fantastic service - worth every penny.We were collected promptly from Geneva by Lewis late Thursday evening and quickly taken to Val d'Isere. It was snowing heavily but got up the mountain safely. Lewis was helpful and efficient and full of interesting information.Our return journey was the following Monday and booked for 8am for a 2pm flight. It had snowed all weekend and there were avalanches on the road out of Val so Roz finally arrived at 10.30am having been queueing to get up the road from 7am. We were kept informed all the time as to what was happening and Simon advised us to change our flight which we duly did thank goodness as we arrived at Geneva at about 2.30pm. Roz was really excellent - helpful, efficient, safe and interesting. The vans were warm and comfortable and clean and we had water on offer.We would definitely use Mountain Rescue again and have no hesitation in recommending them to everyone. In car entertainment on request.